Since adding a meatless meal into your weeknight dinner plans is a good idea for both your health and your wallet, we encourage you to give this a try! 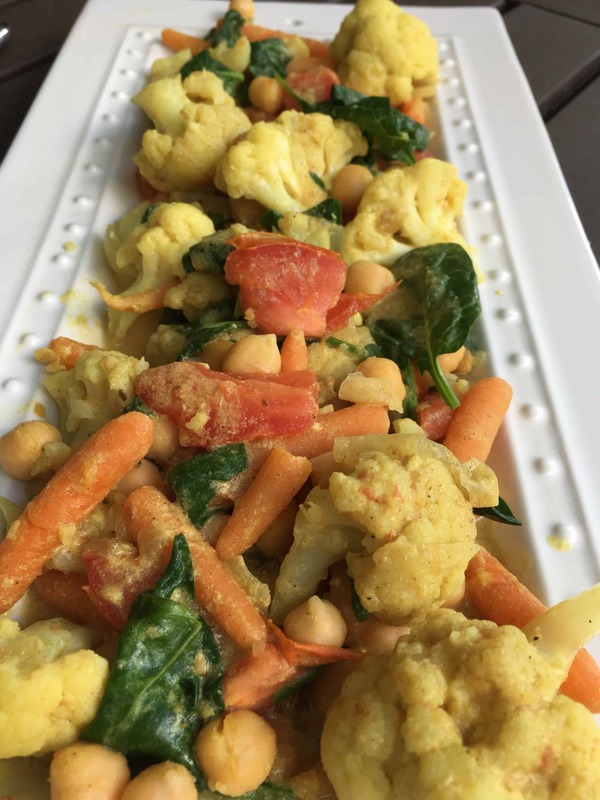 Served with a simple crisp salad and some naan bread you have all the makings of a healthy vegetarian meal that your whole family will enjoy. If you try this one, please leave us a comment below and tell us how you liked it, or if you changed anything! Add coconut milk to a large skillet. Stir in curry powder, ginger, garlic, onion and salt. Add cauliflower and carrots to skillet and heat on med/high. Bring to a boil then reduce heat to low and cover. Cook for about 10 minutes, until veggies are tender, stirring occasionally while cooking. Add tomatoes, chickpeas, and baby spinach to skillet and cook until heated through and spinach is wilted, about another 5 minutes. Remove from heat and stir in cilantro and adjust seasoning with salt and pepper to taste. Serve with a salad and naan bread. YUM! Read more about the Vegan & Vegetarian Meal Plans from The Dinner Daily and find out how easy and affordable it can be to add more vegetarian meals to your diet!